From research to business with nanotechnologies - B. Deschamps, Grenoble. 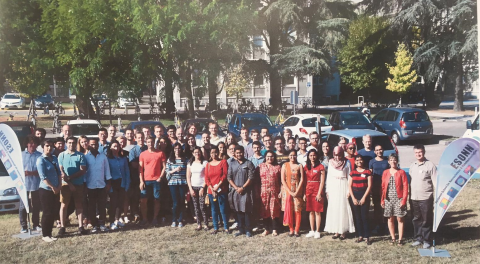 Additionally half of the time during the summer school was devoted to practical classes in different laboratories all around Grenoble where we got “hands-on” experience is chosen topics. Natalia participated in 7 classes e.g. “BioChips” Introduction to DNA microarray technology and application to comparative genomic hybridization or Characterization of Nanostructures by Transmission Electron Microscopy. During the school besides participation in the classes Natalia Olejnik also presented a poster titled “Spectroscopic studies of dynamic surface chemistry of semiconducting nanocrystals”. ESONN was a great experience where besides broadening knowledge in Nanoscience and Nanotechnology subjects. Natalia was also able to get practical experience with various analytical methods that potentially could be applied to her research, and got inspiration about what can be done in her field.